We recently started getting this order, and searching around didn’t turn up anything useful. So we emailed Apple’s support, and they send the following answer. It worked like a charm! However, instead of the credit card information, it was address information that was messed up. After correcting the address info, all was well. 2) Click Account in the upper-right corner, then click "Change account information" and sign in using the same Apple ID and password you use for the iTunes Store. 3) You should see your account-profile page. Under Method of Payment, remove all of the characters from the Card Number field. Do not change the expiration date or credit card type. 4) If you haven’t already, select where you primarily use your purchases from the pop-up menu near the bottom of the page. 5) Click Continue. If you are asked to enter any other information, be sure to click Continue after making the updates so that your changes will be saved. Note: Installing the latest version of iTunes will not affect your library or any items in your account that you haven’t downloaded. 8) Sign in to the iTunes Store using your account name and password. 9) On the Apple Account Information page, click the Edit Payment Information button. 10) Enter your payment information and click Done to save your changes. To ensure your account is functioning, try downloading a free item from the iTunes Store. To do this, navigate to the iTunes Store main page by clicking the Home icon near the upper-left corner of the window. Scroll down and click the "FREE ON iTunes" link near the bottom of the main page, then select an item to download. Upgrading iTunes Purchases—Is It Worth It? So at MacWorld, Apple announced it is removing DRM from the songs in iTunes, and you can unprotect any previous purchases for a 30-cent charge. The question is, it it worth it? Or should you look into a music converter like DVD neXT COPY iTunes (example only –never used it, but seen good reviews), which will convert your DRM-protected songs into a different format without burning them to a CD? My music library is a mish-mash of formats. I have a lot of protected media that I purchased from iTunes, and some from CDs I ripped early on before I figured out how to change the settings. I have an even greater amount of music purchased from Amazon and from CDs after I changed the output to MP3. To be smart, you need to separate the protected files from the unprotected ones. In iTunes, you can right-click the row of column headings and add the Kind column. Then, click on the Kind column to sort all your music by kind. Create a playlist for your AAC music, select the â€œProtected AACâ€ and â€œPurchased AACâ€, and drag them to your AAC playlist. As you drag to the playlist, your cursor will indicate the number of songs youâ€™ve selected. In my case, 744. Multiplying 744 songs by 30 cents each puts the price at a complete upgrade at roughly $233. The software costs $30, and is completely automatedâ€”tell it a playlist, and let it go. Itâ€™s a no brainer for meâ€”the software is much cheaper and much less hassle. Are my MP3s going to be the most technologically perfect reproduction of live sound? Nope. Can I tell the difference? Nope. Good enough for the car, airplane or office. If you care about that, youâ€™re not using MP3 anyway. Once the music is converted, I can upgrade my iPod to the RockBox firmware, and add some additional features to my iPod, and maybe replace iTunes with Songbird. Songbird apparently supports protected AAC, but RockBox does not support AAC (protected or otherwise) at all. Bottom line, before you start paying to remove DRM, do the math and make sure itâ€™s cost effective to do so. soon as the music started, they’d lose their connection again. These are Bluetooth-enabled headphones that connect to my iPod with a tiny transmitter. There are 5 buttons on the right earpiece (play/pause, FF, REW, vol up, vol down). Both the headphones and transmitter are rechargeable. The volume buttons are easily distinguished from the FF/REW by small dimples in the buttons, and the play/pause doubles as the power button on the headphones. So far, I’m really pleased. These are not the lightest headphones you’ll ever wear, and people with melon heads may find them a little tight on the ears (especially if they wear glasses). The sound quality is surprisingly good–in fact, some of the best I’ve heard through headphones (not as good as my Etymotic ER-6i earbuds, but that’s to be expected). The Bodeans are crisp and clean, and my classical selections are full-bodied. The bass response is quite good, without sacraficing treble or suffering distortion. If I didnâ€™t know these were from Logitech (which I still think of as a mouse company), Iâ€™d believe the speaker portions were from an audio company such as Shure or Sony. The headband goes behind your head, not on the top, so it wonâ€™t mess up your big hair. The headphones/transmitters are paired, so I donâ€™t know if the signal can be shared. Iâ€™m the only one I know with these headphones, so I canâ€™t test it, either. For me, the best part is the wireless control. Iâ€™m no longer chained to a 4â€“foot radius in my office. I can move about freely, and still have control over the songs I listen to with the FF/REW buttons. Itâ€™s kind of Trekkie to press a button on the side of my head when a coworker stops by. Remember these control an iPod, not iTunes, so if youâ€™re listening at home, youâ€™ll need to use your iPod. At the end of the day, I just plug in the headphones and transmitter and let them charge overnight. Iâ€™m ready to go the next morning! 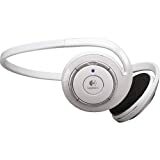 I would still recommend the Etymotic ER-6i earbuds for lawnmowing (snowblowing for the next few months) or plane travelling, but Logitechâ€™s Bluetooth headphones are awesome for the office. Here’s the transmitter mounted on my iPod. USB-powered lava lamp not included. An article in the WSJ yesterday looked at Microsoft’s new focus on hardware with the introduction of the Xbox 360. Some speculation of a Microsoft MP3 player (which I giuess would technically be a WMA player) was also mentioned, as the quest for an iPod killer continues. I’m not sure MS should get into the iPod killing biz. Let Rio, Dell, etc. duke that out, because I doubt a single device will do it. Apple’s hit on something with its design, which appeals to a lot of people. The other players are different in some areas by necessity–size, capacity, controls, and the appeal is to a smaller crowd not happy with the iPod features. What Microsoft could/should do, is get all the different manufacturers together, and get everyone to standardize on a single connection. That’s the true key to unseating the iPod. For the past several generations of iPods, Apple has used the same “dock connector”. Millions upon millions of iPods all connect to computers, car audio systems, FM transmitters, chargers, portable stereos, etc. using the same connection. For the other players in the market, everyone has a different connector. My car charger will work with my 15GB 3G iPod just the same as my wife’s Nano. With iPods, reaching a small percentage of users means sales of several hundred thousand to a few million units; for everyone else, a few thousand tops. If I’m Griffin or Pioneer, I’m pretty much going to ignore everyone but iPods, since that’s where the sales are. But if Rio, Dell, etc. all had the same interface, accessory makers could market to all of them at once, and build the “not iPod” community as well. BMW has an iPod connector, and Honda and others are working on them as well. Imagine what that says to people looking at the devices–tremendous support across industries for the iPod, zilch for the others. I spend a lot of time in my car, and my next one will have an iPod connector. The others don’t stand a chance without standardization. Microsoft did a great job with hardware standardization in the PC world. How about the audio player world? After that, get on the cell phone manufacturers. iFill streams mp3 files from thousands of free radio stations directly to your iPod. You can choose several stations at once and select from many different genres. And since iFill goes directly to your iPod, it won’t clutter up your hard drive with extra files. This was reviewed in the Wall St. Journal today by Walt Mossberg, who found a problem with Windows PCs, but a new version was released just as the paper went to press. Full review at http://ptech.wsj.com/archive/solution-20051116.html (free site, no subscription required). As Walt says, provided the Windows version works as well as the MAc version, this is a product to have (cheap, too!). According to the settlement’s terms, people who fill out a claim form are entitled to receive $50 redeemable toward the purchase of any Apple products or services except iTunes downloads or iTunes gift certificates. They can redeem the voucher within 18 months of final settlement approval at any bricks-and-mortar Apple Store or online. Consumers who had battery troubles can also get their battery or iPod replaced. Apple currently replaces or repairs defective products that are returned within one year but the class-action settlement extends the warranty to two years, plaintiffs’ lawyers said. Consumers who file a claim must have a receipt. I tried following the link for www.appleipodsettlement.com, but it seems to be a little burdened right now. 6i isolator earphones are designed specifically for use with the Apple iPod and other small portable players, offering 8 dB higher overall sensitivity and slightly more bass than the ER-6 isolator earphones. I just received a pair for my birthday…incredible! I use a similar triple-flange earplug when shooting, and these plugs block a ton of background noise. This means you can keep the volume at a very low level when listening, so your hearing is preserved. These are awesome for mowing the lawn–can’t hear the lawnmower, and again, the volume can stay low. The sound quality is very impressive–music is clear and crisp. It’s a little tricky to insert these correctly the first couple of times, but you can tell easily by the sound. There are aspects of music I hadn’t heard before! For instance, in Tom Petty’s â€œEven the Losersâ€œ, there’s a small pause between the intro and the main song. I always thought it was blank space, but there’s actually a woman’s voice (quietly) shouting â€œIt’s just the normal noises in here!â€œ. No idea that existed. I don’t recommend these if you have co-workers who enjoy sneaking up on you, or if you have to answer the phone a lot. You simply won’t hear what’s going on. Which is great for mowing the lawn, or travelling on a plane. Now that I’ve been using these earphones for a while, I’m even more impressed. The soft silicone plug fits my ears very nciely, and blocks a lot of sound. When mowing the lawn, the lawnmower is a dull hum, and softer sounds aren’t even heard. I can listen to my iPod at slightly above normal volume, and my ears aren’t ringing when I’m done (which is usually about 2 hours). Neighbor’s kids screaming in the yard when you want a quiet moment on your deck? No problem–you won’t hear them with these earphones in, either listening to your iPod or not. I’ve made several plane flights using these, a few in excess of 5 hours, and it’s amazing to get off a plane without that jet engine hum ringing around in your head. Very pleasant. A few times I’ve had to take the plugs out to equilibrate the pressure, but that’s no big deal. On a sweaty day, or after a lot of use, you can build up a little crud on the plugs. That’s easiest to clean off just after you take these earphones out. Use a dry cotton swab and gently run the tip between the flanges. Good as new.